Veronico and Emilia can also prepare delicious local dishes. Please check with them for availability and prices. Drinks are available upon requests: water, soda, fruit juice, wine, beer, but also local products such as punches and grogues from the island of Santo Antão. Please check with Veronico and Emilia for availability and prices. Harbor: the cost for this service with our car is 2 euros one way (maximum 4 people). Airport: the cost for this service is 10 euros one way with our car (maximum 4 people). - harbor : 160 escudos (about 1.50 euros) during the day and 180 escudos (about 1.65 euros) at night. We provide to our customer a laundry service. The price for a machine of up to 5 kilos is 6 euros. We provide our customers a computer connected to high-speed Internet, accessible 24/24 for free. Free WiFi is available throughout the residence (sometimes a bit difficult to get in the small studio "Tchá Bai"), which is located quite far away from the transmitter signal. Smoking is prohibited inside the residence and only permitted on the terraces, balconies and yards. Water is rare therefore valuable in Cape Verde. Please be economical and don't waste it. For instance it is unnecessary to let the water run continuously when you soap in the shower, you brush your teeth or shave. - the CDs "Lunario Perpetuo", "Benlibem", "Sarva Mangalam", "Canto das Estrelas" and "Tuviterramar". The name "Windelo" originates from the fertile mind of the ineffable François Guy de Boavista, the "Admiral of the Sands". Former sailing champion, he has been running a windsurf school in Boavista for many years. François left us on October 9th, 2012. Check out his story by visiting his website at http://www.boavistawindclub.com. The house is located in the "Alto de Santo Antonio" area in Mindelo, one of the very best places in town, with an unbeatable view of the bay. The town centre is a 10-minute walk and the "Laginha" beach 15. Mindelo is considered the cultural capital of Cape Verde. With 60 000 inhabitants, it is the second biggest city of the archipelago under the "administrative" capital Praia, which shelters about 130 000 inhabitants. not to forget the Carnival (the whole town is in the street), the "Saint-Jean" feast, and also the famous Baia das Gatas festival in August. Mindelo is also a harbor with a colonial architecture, visible throughout the city with the colorful houses and the magnificent Governor Palace. The Mindelo bay is classified as one of the most beautiful bay in the world. Independent since 1975, Cape Verde (or Cabo Verde or Capo Verde) retains the mark of very strong Portuguese traditions. At the crossroads of Europe, Africa and South America, the mixed influences of the three continents are noticeable through a rich racial and cultural interbreeding. - the windward islands Barlavento: Santo Antão (779 km2), São Vicente (227 km2), São Nicolau (343 km2), Santa Luzia (45 km2), Sal (216 km2) and Boa Vista (620 km2). They are the northern ones. - the leeward islands Sotavento: Brava (67 km2), Fogo (476 km2), Santiago (991 km2) and Maio (269 km2). They are the southern ones. Flying is the only realistic option for getting to Cape Verde. There are infrequent sea services, but they will probably end up costing as much as a plane ticket. As of today there are four international airports: in Espargos on the island of SAL, in Praia on the island of SANTIAGO, in Rabil on the island of BOA VISTA, and in São Pedro on the island of SÃO VICENTE. Please find a non-exhaustive list of the companies that operate international connections to the islands on the "links" page of this site. TACV, the Cape-Verdean national company, connects daily the islands of Fogo, Santiago, Maio, Boavista, Sal, São Nicolau and São Vicente. Best is to book in advance from your home country the TACV "passes". Check here for offices directory http://www.caboverde.com/pages/615813.htm. and here for their website: http://flytacv.com. Santo Antão and Brava remain only accessible by ferry. The desert island Santa Luzia is the hardest island to reach since there are no regular connections, your only chance is to find a fisher boat in the small village of Calhau. It is also possible to get tickets once you arrive in the archipelago, but you are taking the chance of waiting for several days before getting on board, especially during high seasons (Christmas/New Year, July/August and February with the Carnival). Prices are almost identical whether you book your ticket in advance or buy it on the spot, slightly cheaper with the second option. Price range is 40 euros - 130 euros one-way. Although the TACV really improved its quality of service in recent years, please do keep in mind that flights are not always on time. Flight cancellations exist also. As much as possible try to confirm your flight 72 hours before departure by calling (phone number on your ticket) or by going to the nearest TACV office. Another good practice is to call the day before to validate the departure time and to leave a telephone number where you can be reached.In case of flight schedule change, you should be contacted. We would advise you to stay calm in any circumstances, this is a developing country and you cannot expect the same level of service that you would get in your home country. The ARMAS company with its ferry "Mar d'Cannal" offers connections between São Vicente (Mindelo) and Santo Antão (Porto Novo). One, sometimes two, other companies also make that connection. The crossing takes between 30 and 60 minutes. Tickets are available directly at the Mindelo harbor and can be bought up until 30 minutes before departure. The price is around 800 escudos each way. Regular boat lines exist to connect Santiago (Praia) with Maio (Vila do Maio), Santiago (Praia) with Fogo (Porto de Vale de Cavaleiros) and Santiago (Praia) with Brava (Porto da Furna). For more information about schedules and prices, please check http://www.mindelo.info/_transports_bateaux.php. Aluguers are group minibuses, sometimes pick-up trucks, connecting villages for a very low fare. To access more remote beaches or villages you need to hire an aluguer that will cost the taxi rate, which is far less economical. Praia and Mindelo have their own bus system...fairly complex. Last, car rental (often 4X4) can be found, with prices ranging from 35 to 80 euros a day. - Multi-entries visa valid 6 months 86 euros. Expect a 48 hours delay, one week by post. It is also possible to get a visa directly at the airports of Espargos (SAL island), Praia on the island of SANTIAGO, Rabil on the island of BOA VISTA, and São Pedro on the island of SÃO VICENTE, for 25€ per person (no family rate available), on presentation of a valid passport (no pictures required.) This is for information only, we would not recommend to depart to Cape Verde without a visa as the airline could prevent the boarding of the plane. No vaccine is required to travel to Cape Verde. There is no malaria, except for a small area on the island of Santiago (absolutely no risks whatsoever in São Vicente). The sanitary level is very good, far much better than in most African countries. Mindelo's hospital is regarded as the best in Cape Verde, but its equipment remains below European or American standards. Medicines can be found fairly easily in big cities' pharmacies, but they are imported and thus more expensive than in Europe or in the States. A good precaution is to prepare your own first-aid kit including basic medicines before you go. Don't drink tap water, which for the most part is produced by desalinisation factories. This water is drinkable but its quality is altered by the distribution pipe network. Buy bottled water and try to avoid ice cubes when unsure of their origin. The currency is the Cap-Verdean escudo (CVE). It can only be changed locally. For information : 1 EUR = 110.265 CVE. You will find a "bureau de change" opened 24 hours a day at your arrival at the Sal international airport. Others can be found with more restricted operating hours in major cities. They all take a commission, and you will need to present your passport in order to change money. Banks also will change your cash. Most of them will change your American Express Travelers checks. You will also be able to make an international withdrawal by presenting a Visa card or Eurocard-Mastercard (as far as we know, American Express card is not accepted!) and your passport. Commissions vary from one bank to another. To change between 5 and 650 euros (at the official rate, 1 euro -> 110.265 escudos), the Caixa Economica de Cabo Verde (green sign) takes a fee of about 3 euros. Banks can be found in all major cities. The hours of operation are Monday to Friday from 8:30 or 9:00 am to 3:00 pm (closed Saturday, Sunday and Bank Holidays). Except for big hotels and some TACV offices (to buy inter-island plane tickets), you won't be able to use your international credit card as a mean of payment. Best is to carry enough cash or travelers checks (prefer big notes as some banks apply charges proportionally to the number of checks). Hence you will avoid the unpleasant surprise of hitting the weekly withdrawal limit of your card; question your bank to be aware of this limit before your departure. Warning: don't leave the archipelago with escudos as you won't be able to change them abroad (unless you know some emigrants). Cape Verde is a safe and stable country with no particular dangers. Violence and crimes are quasi non-existent, and attacks of foreign tourists were extremely rare up until mid-2006. Since then a few cases of muggings, sometimes violent, have been reported in Praia on the island of Santiago and in Sal, and to a lesser degree in Mindelo on the island of São Vicente. Those safety issues should not be ignored by travellers, even though statistically the risk is extremely low. Praia in Santiago and Mindelo in São Vicente, the two major cities, exists petty criminality, pickpockets most notably. The rare thefts are often imputable to the tourists’ lack of caution. Wallets, cell phones, cameras and handbags are objects of desire. Without falling into a paranoia that would spoil your holiday, be vigilant and use good sense, like in any tourist places. As a general rule, don't carry your personal documents with you. Except at the bank or at the travel agency, nobody will ask you for your id or your plane tickets. Leave them, along with your credit card and your money in the safe of your hotel or in a locked case. Think of writing your passport and credit card numbers on a paper that you keep separated from your wallet, this could be useful in case of theft or loss. At night, prefer a taxi (180 escudos, equivalent to 1,60 €) to move around even to cover small distances. Be also aware that Cape-Verdean thieves are agile climbers; hence think of closing the door of your room but also the windows when you leave your hotel, and don't leave any valuables near open windows at night when you sleep. Swimming remains a danger to consider. It can be hazardous at times in some areas that are prone to strong currents. Ask locals before getting into the water or don't swim far away from the shore if you don't have information. Many beaches are perfectly safe though. In São Vicente, the Praia Grande, Calhau, São Pedro and Laginha beaches are watched by lifeguards during the day. To conclude, relax, a vast majority of tourists never encountered any of the problems described above. Use extra caution if you stay in Sal, Praia or Mindelo, but everywhere else is fine. Natives are naturally welcoming, friendly and hospitable in this country and you can travel around safely. The climate is of dry tropical type. There are two distinct seasons, the dry one from November to June, and the rainy one from July to October. Precipitation occurs in convectional thunderstorms and is irregular from one year to the next. It is usually concentrated on hilly regions (Santo Antão, Fogo and Santiago.) During the very few days of rain on the island of São Vicente precipitation seldom lasts more than one hour. The air temperatures vary between 20 and 30 °C (68 and 86 °F), the oceans' between 23 and 26 °C (73 and 79 °F). Night variations are low, except in high altitudes. Generally speaking, the climate in Cape Verde is particularly pleasant for tourists, but dryness and lack of rain does not facilitate the life of the locals. Bring a sweat-shirt or a pullover. You will need a warm sweater while trekking in high altitudes, like in the Santo Antão Mountains, the Monte Verde in São Vicente (774 meters) or the volcano in Fogo where it can be cold at times, especially in the January-March period. The official language is Portuguese, but it is only used by administration officials, on TV or on the radio. Cape-Verdeans speak Crioulo (a "customized" Portuguese), or rather "the Crioulos", since each island possess its own dialect, all having the same roots. The natural characteristics of the archipelago and the various influences it received over the centuries explain this diversity. One can communicate by using French (Cape Verde belongs to the French-speaking countries' community) but also sometimes English or Spanish. 220 volts, and the sockets have about the same format as in Portugal or France. You will need a step-down converter if you are coming from the United States and a plug adaptor if you are coming from other parts of Europe. The international code for Cape Verde is 238. From abroad, dial 00-238 followed by the seven digit number, which first digit is 2 for land line phones and 9 for cellular. From Capo Verde, dial 00-<country code> followed by the number. All the islands have pay-phones that use cards. These can be bought in post offices, some drugstores and gas stations. You can bring and use your cell phone there. Any CV Telecom office will sell you a SIM card for 4,045 escudos (about 36 €) that comprises 3,000 escudos (about 27 euros) of communications. You will be able to make calls from your cell for one month and to receive calls for three months. Any remaining credit at the end of a month won't be reported to the next. If you don't reload it your phone will automatically be blocked for calls and call receptions after one and three months respectively. Passed three months the card will be disabled. A refill costs between 15 and 30 euros depending on the calls credit. Please note that your cell shall not be blocked for an exclusive use by your operator. Verify before your departure and if necessary have it unlocked. Having it unlocked in Cabo Verde is possible and will cost you between 15 and 30 euros. Post offices are open Monday to Friday from 8:00 am to 12:00 pm and from 2:00 pm to 5:30 pm. They can be found in all cities. It is possible to call international, to send fax and express mails. Postcard stamps for Europe or America cost 60 escudos and the delivery takes 7 to 10 days. Internet cafés can be found in all major cities. The connections are usually good and the fares low. It is also possible to call international at those places, for a better rate than at the post office. One hour behind the UK in winter, two hours in summer. Two hours behind the rest of Europe in winter, three hours in summer. Fours hours ahead of US Eastern time in winter, three hours in summer. 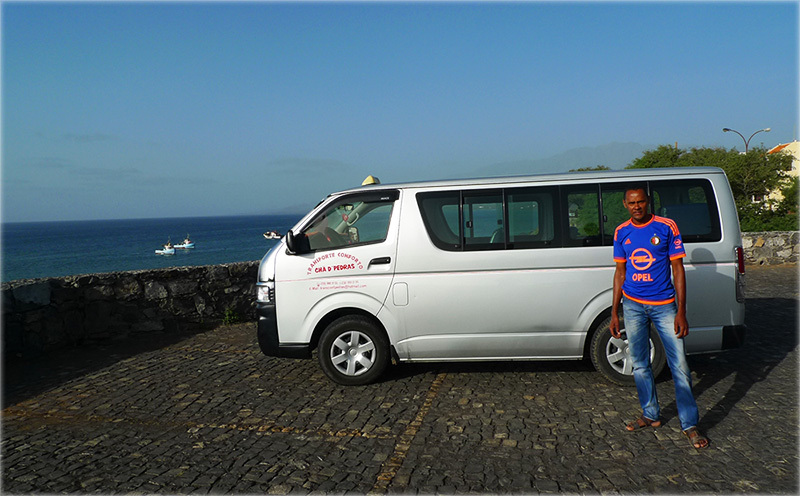 On the other side of the channel, the team of the "Transporte Conforte Chã Pedras" minibus offers its services 24/24 hours and 7/7 days on the whole island. The transport is guaranteed under the best conditions of comfort, hygiene and safety at moderate speed. The languages spoken are Portuguese, Spanish, English and French. The team provides with all the regular services at "collectivo" rates, including connections between the cities of Porto Novo (Ferry port), Ribeira Grande, Ponta do Sol and Paúl. This allows you to reach your hotel wherever it is. It can also provide you with a nice discovery of the island by organizing tours (half day or full day) and assist you in planning your hike. - On site at the residence please contact Veronico, our manager. The Casa Laranja (the orange house) is a modern newly completed one bedroom apartment in "Ponta do Sol" on the island of Santo Antão. It is the perfect place to escape from the stress of city life combined with a nature orientated holiday. This modern Apartment offers a very unique setting with impressive Sea-Mountain and Sunset views. 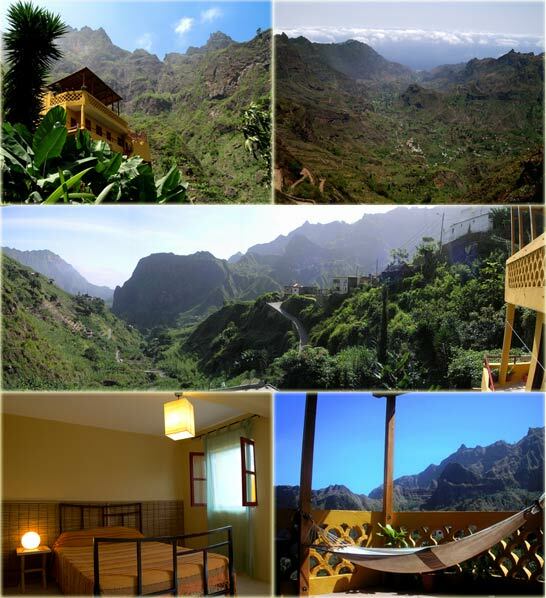 The Casa Cavoquinho is located in the highest part of the "Vale do Paúl" on the island of Santo Antão. It is the ideal place for hiking, relaxing and enjoying nature. Paúl is situated in a tropical zone, and has exceptional diverse vegetation including almonds trees, banana trees, bread fruit or the dragon tree which fascinates the traveler. Jose and Belén offer their customers restaurant service, with delicious Capeverdian and European dishes to complete your stay in Santo Antão. Use the promotional code "WINDELO" and save 5% on your booking in their establishment.